After the video was posted on YouTube, Tesla stock suffered a rare down day on Wall Street. A video posted on YouTube that shows a Tesla Model S on fire is being blamed for pushing down the company's stock price Wednesday. The crash happened near Seattle on Tuesday morning. The person shooting the video said he could feel the heat from the fire from half a block away. The man recognized it as a Telsa as he drove directly in front of the car. 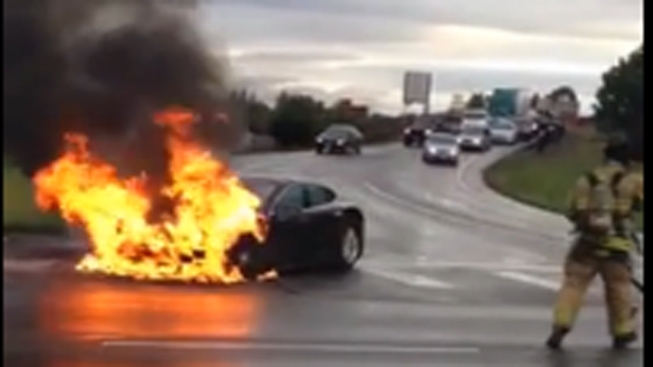 The video shows the front of a Tesla Model S in flames. Tesla confirmed to CNBC that the vehicle was a Model S. Tesla said the car hit "a large metal object in the road" on Tuesday, causing significant damage. Tesla says the fire was caused by the "substantial damage sustained during the collision." The Tesla's driver reportedly told authorities he began to smell something burning and then the vehicle caught fire. Firefighters needed several attempts to extinguish the flames because the blaze kept reigniting, Webb said. A trooper who responded to the scene was unable to locate any objects on the roadway, but Department of Transportation workers did observe some debris near the scene. Chris Webb of the Washington State PatrolWebb said there was too much damage from the fire to see what damage the debris may have caused. Tesla also stressed the fact that the driver escaped unharmed. A Tesla Model S has a $70,000 price tag. Tesla shares have risen more than 400 percent since the start of the year, but the stock fell more than 6 percent Wednesday, to $180.95. The fall picked up steam at the end of the trading day and at one point was down 9.1 percent. It was the stock's biggest one-day decline since July 16. Investors seemed to be thinking the fire could be an indication of a flaw in the company's battery packs. The company's battery system and the Model S itself have received rave reviews, including a top crash-test score from the National Highway Traffic Safety Administration and a tie for the highest auto test score ever recorded by Consumer Reports magazine. Here's the video. Warning: it contains graphic language.